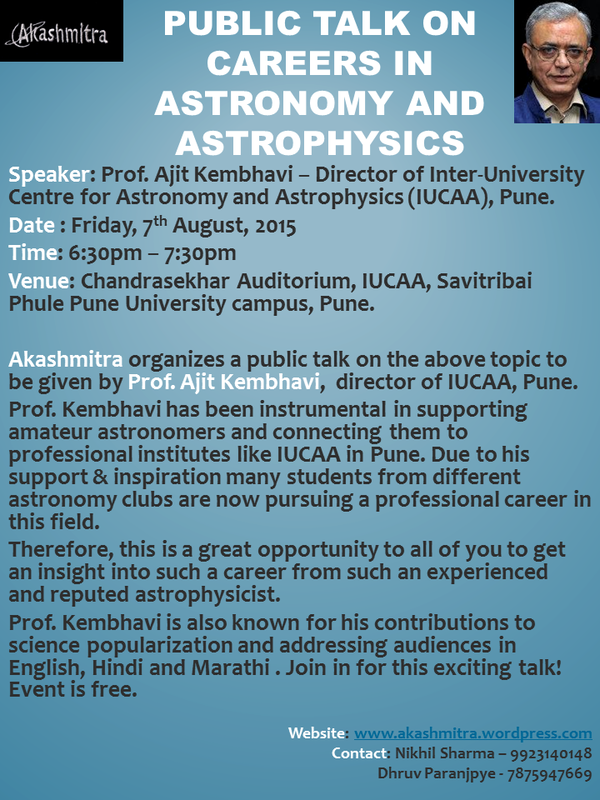 7th August, 2015: Public talk to be given by Prof. Ajit Kembhavi – director of the prestigious Inter-University Centre for Astronomy and Astrophysics (IUCAA), Pune on the topic “Careers in Astronomy and Astrophysics”. A great opportunity for all to learn more about exciting careers in this field from an eminent scientist like Prof. Kembhavi. I wish I could attend this session too. I’m sure there’ll be lots of interest not only from students / enthusiasts / amateurs in India who don’t live in Pune, but also from people abroad (like me!). It might be short notice for this event, but consider proposing to Akashmitra opening a audio conference and screen share (like WebEx) for such sessions, so more people can join remotely! Sure, Rahul! We will be glad to broadcast it live. We will be trying a live stream. Once we get a confirmation I’ll post the link.